A research by Research2guidance has come out with surprising results which reveals that an Average Symbian app makes 160% higher download per day compared to iOS apps. Despite all the hype around Android and iOS, Symbian gets 2.5 times more downloads followed by WP7 and Blackberry. The reason behind this is lower competition, yet sufficiently large user base which demands apps. Symbian still has the highest potential user base. 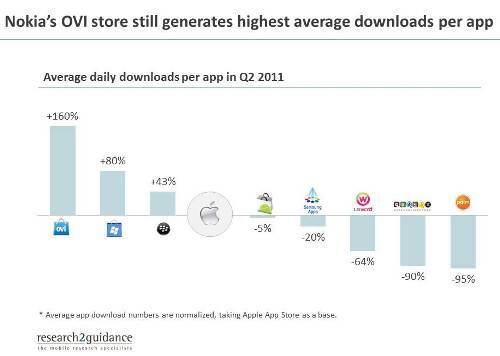 Also Apple App Store has around 400,000 apps, while the Ovi Store has just a tenth of that. So users have less but better choice for any application they need. Looking into average numbers, the Android Market stands far behind the Apple App Store, with average Android App attracted just 5% less users than iOS. On the other hand small platforms like Samsung App Store and LG World have lesser apps which makes searching for an app easier but are struggling to get user attention as their Customer base is much lesser than what it should be. Note: All the results have been calculated keeping iOS as the base. So what do you feel about this Research and the result? Do share your views.